Not long ago, I shared about how to Make A Summer Bucket List. More recently, in The Skinny on Childhood Obesity, Lance shared a recommendation that children spend at least one hour a day getting moderate exercise. It’s easy to enjoy active summer fun on ideal sunny days, but what about when you wake up and it’s raining? When we think of summer time, we might think of the sun. But, a warm rainy day can also be fun. Keep this Rainy Day Bucket List handy and enjoy some outdoor play! Sidewalk chalk is not just for sunny days. Draw on wet pavement and it comes out a bit more like paint. Plus, as the rain comes down harder – or if you draw on an incline – it’s fun to watch the colors stream away. Make small paper boats or create floating devices from acorn caps, small sticks and other found items. Float these down rain rivulets. Touch football. Kickball. Soccer. Dodgeball. Almost any backyard ball game becomes more fun in the rain. Just be sure to have clean up towels and a laundry bag ready to go because everyone will get extra muddy! Create an obstacle course full of silly, wet fun – hula hooping, jumping in or over a puddle, tossing a water balloon at a target, carrying a bucketful of rainwater slalom style, etc. Some dirt or sand, a couple old pans, a few recyclables, and a handful of twigs and leaves for decorations are all you need to make a rudimentary mud pie kitchen in the rain. Kids will thrill to exercising their imaginations as they get their hands dirty designing their space and cooking up dripping delicacies. As long as there is no thunder and lightening, a rainy day is perfect for a walk in the woods. Listen for how the rain sounds as it filters through the treetops. Notice how certain areas seem to stay dry while others get soggy. Have a race to jump from one dry spot to another, or, for even more wet fun, setting foot only where it is soggy. 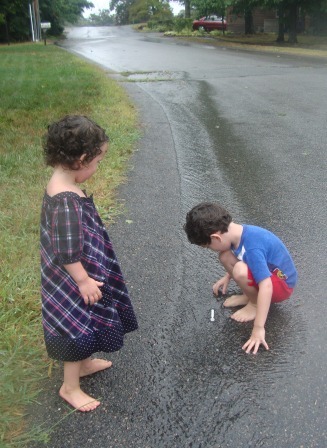 Challenge your kids to notice ten things that are different in the rain. Some questions to get you started: What happens to dry pine cones as they get wet? How is the color of the pavement? Do flower blooms look any different? Head outside with a mission: Determine which creatures seem to like the rain and which do not. Note all the critters you can find that are hanging out, obviously, in the rain. Then, turn over rocks, logs, and other hiding places to see what other creatures you can find. How often have you been frustrated when your kids draw on themselves with marker? Perhaps a rainy day can help by giving them a time and place to do so. Test that a marker is easily washable. Then, when there is a heavy downpour, put on your swim suits, draw designs all over your limbs and run outside to wait for the rain to wash it off. For some sensory fun, under the cover of a deck or tree, use a can of shaving cream to dress up: Make a beard. Give yourself puffy arms. Get silly. Then, step into the rain and let your work dissolve. And, of course, the tried and true, just running around singing in the rain is always fun, too! Do you have another idea for enjoying time outside with a warm summer rain? Do share in a comment! Turning Two . . . Pick Your Own Blueberries, Means Great Blueberry Muffins!